Hello friends! How was your weekend? Awesome, I hope. John and I did some relaxing, brunching, pizza-ing, and working on a new food photography product. I also bought and returned a pair of overpriced yoga pants out of sheer buyer’s remorse. Does that ever happen to you? Sometimes, we just have to make mistakes like that in life. It’s been a week since I’ve eaten ALL of these granola bars, but I’m still dreaming about them and peeking in the freezer to make sure I didn’t overlook one last piece. They’re that good. These brownie granola bars kind of started out as a failure. The idea was to make date-sweetened brownies and I resorted to adapting my go-to Vegan GF Black Bean Brownies. Problems ensued. I ate one and had to throw the rest away. Not good. Not good at all. In life do you ever find yourself trying to fit a square peg in a round hole? That’s what I was doing with these brownies. I wanted date-sweetened brownies but the blog universe was telling me something different. When I’m trying to fit my square recipe into a round hole, I rethink it. The result was a simple, naturally-sweetened, healthy granola bar that was a little on the decadent side – just the way I like it. These bars DO indeed taste like a raw brownie. They require just 7 ingredients. 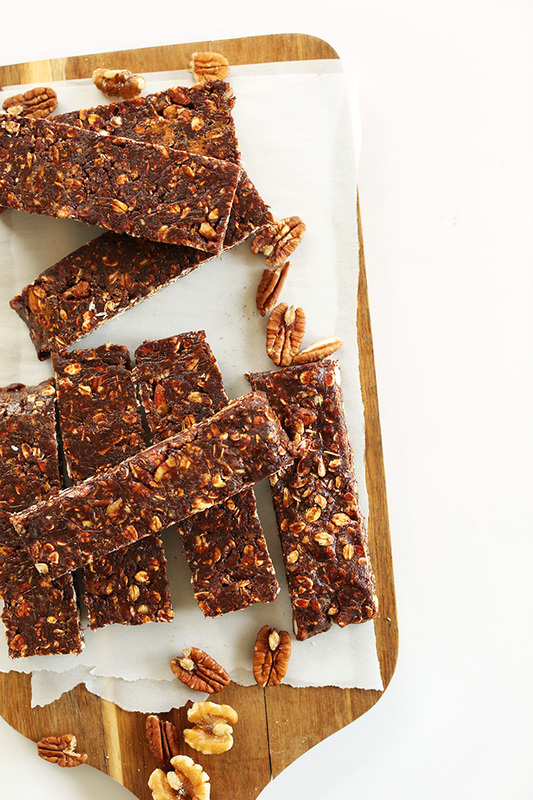 They’re no bake, aside from toasting your oats and nuts (an optional step). They’re loaded with antioxidants, fiber, protein and healthy fats. They’re perfect for breakfast, dessert or a quick snack. They’re really just kind of perfect. I did have one for breakfast and found it quite filling. But for the most part I ate these as a healthy dessert. I’d go to the freezer, break off 1/3 and snack. Then repeat for the next 30 minutes until it was gone. Self control comes in waves, people, especially with these bars. You MUST try these bars and let me know what you think! Tag a photo (#minimalistbaker) on Instagram or @minimalistbaker on Twitter so I can see how lovely yours turn out. Happy brownie making! 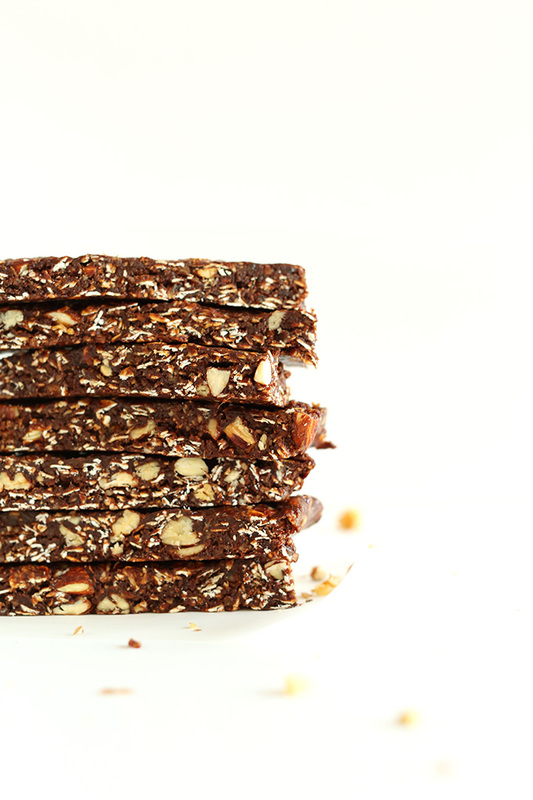 7-ingredient granola bars that taste just like a raw brownie! 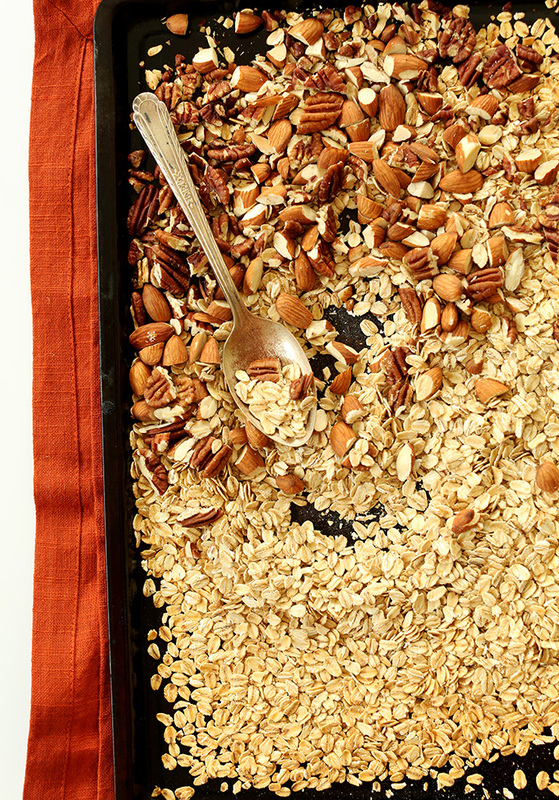 No baking required besides toasting the nuts and oats – an optional step. Simple, all naturally-sweetened and so delicious. Optional step: Toast your oats and pecans in a 350-degree F (176 C) oven for 15 minutes or until slightly golden brown. Otherwise, leave them raw – I prefer the toasted flavor. Process walnuts in a food processor until a loose meal is reached. Remove from bowl and set aside. Add dates and process until small bits remain (about 1 minute). It should form a “dough” like consistency. (Mine rolled into a ball). Add walnut meal and cocoa or cacao powder back in with the dates and process to combine. Transfer mixture to a large mixing bowl and add the (toasted) oats and nuts and stir to combine. You may have to use your hands to really incorporate the mixture well. Once thoroughly mixed, transfer to a 9×13 dish (or similar size pan // adjust if altering batch size) lined with plastic wrap or parchment paper so they lift out easily. If using a 9x13, ONLY USE 3/4 of the pan so they have the proper thickness. Otherwise they’ll be too thin. Cover with parchment or plastic wrap and press down firmly to even out the top. Freeze for 15-20 minutes to harden. Lift bars from pan and chop into 12 even bars (or more if you prefer). Store in an airtight container in the freezer or fridge to keep them extra fresh. They will get a little sticky when left out at room temp. To me they are like the healthy version on a Snickers bar. Even my husband and few friends have tried them and think the same. These are really easy to make and are definitely approved by all people in my house both big and small! I added a little coarse sea salt on top for a little extra indulgence. THIS IS THE MOST DELICIOUS DATE RECIPE I HAVE EVERY MADE!!!! Thank you for this awesome recipe. Aww thanks so much! Happy cooking! I made this into two dozen power balls using a block of date paste so I didn’t need to drag out my food processor. They’re great and toasting the oats helps with both taste and texture. I’m a midwife and need a healthy, energy filled treat when I leave the house at 2am and these fit the bill! I just discovered this recipe and am excited to try it. However, my husband is allergic to walnuts (and only walnuts). What would you recommend as an alternative to the walnut meal? Thank you! Hi Laura! You could try something like hazelnut meal, perhaps? Otherwise, sunflower seed meal may be a good option. I’m not the biggest fan of dates in my food. Can this be made without them or can you not taste them? We wouldn’t recommend omitting them, as the dates help hold the bars together! Along with the other ingredients, you will find that they don’t have an over-powering date flavor. Hope this helps! Thank you very much for this recipe! I’ve been wanting to make something treat-full and tasty and these are great! For the nuts I used cashews, almonds, and walnuts. I think next time I will add flax. I cut them in chunks since they are so filling. Thank you for all your great work! Very tasty. In Canada we have a chocolate bar called an “Eatmore”. This taste just like an eat more and I have to say, that is what we did. My husband and I loved these! Such great flavors. I toasted the nuts and oats and sprinkled pink sea salt on the finished product. We decided to cut them into small bite size pieces because they are filling. Glad I tried this recipe in my search for cocoa bars first! It’s a winner. I made these yesterday, and after 1 bite both my husband and I got a headache! I used Cacao instead of cocoa, don’t know if that made a difference, but it was very disappointing cause they were tasty! These don’t just look appealing to the eyes, I think they are tasty and to top it- it s a truck load of nutrition! Yay! We’re glad you enjoyed them, Cathy! I switched out the dates for two bananas and it worked a treat. My wife doesn’t like “grown up” snacks but even she enjoyed them. Glad to hear it, Mark! This is my go-to template for what I now call “Kitchen Sink Bars”… sometimes I replace half the dates with dried apricots (etc.). I throw in rolled barley if I’m out of oats, or do half & half… any nuts or dried fruit I have around, shredded coconut, hemp hearts, sesame seeds, etc. I will combine the scrapings of pumpkin, almond or peanut butter on hand…. it’s perfect! One question: if everything I use is stored in cupboards, why such a short shelf life in the fridge? Keep it up! Good stuff! We’re glad to hear it, Sadie! When all of the ingredients are combined together, it shortens their shelf life vs. being kept separate which is why we recommend keeping them in the freezer or fridge to keep them freshest! They will keep in refrigerated for up to a week, and in the freezer for up to 1 month. Hope this helps! I am from Dubai and I came across your website while searching for raw bars. And I must say this recipe is so delicious!!! I managed to make them today. And waiting eagerly to take them out of the fridge. I had a good spoonful before they even went in and I’m so bawled over! Btw I will be doing a video of them and will be linking your website to that video so people can see your recipe. Thanks again! 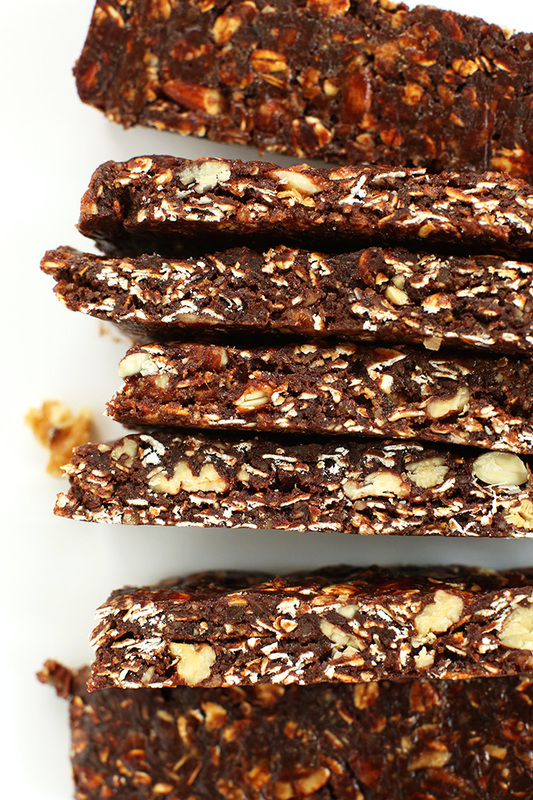 I was a little skeptical at first but when I tasted these bars… OMG!! I will surely be making these every week (if they last that long ?). I added a little coconut and a sprinkle of cinnamon on top before pressing the parchment paper and it was great! Thanks for the recipe!! Hi Dana, thanks for this simple yet wonderful recipe. I used raw cashews and golden syrup. Your tip about using gloves to combine ingredients was very helpful. I’ve eaten quite a few while ‘putting them away’ into Tupperware to share! These are amazing. Highly recommend toasting the nuts and oats and eating the bars frozen ?. These exceeded my expectations. I don’t usually like raw bars. Toasting the oats & nuts made them so good. Hi Brenna! The texture may be a little different but I think that should work! Just made these! Delicious! My freezer is just little though so in fact I had to bend the sheet of pressed ‘dough’ to make it fit… do you think it would work okay balled up into little spheres? Are you thinking like energy bite balls? I think that would work! Wow, delicious but definitely messy when scraping the dates out of the blender, took a while but the time was worth it! Also, I made a few substitutions: I didn’t have any pecans nor walnuts so used instead 1 cup of almonds, 1/2 cup of almond meal, and 1/2 cup of flax seeds. I let them burn just a tad which gave an awesome kick. Also, no need for the honey or sweetner, the dates are already so sweet and high in sugar on their own! Lastly, I had some chocolate/date mix leftover and realized it tasted just like how I imagine vegan fudge so I set some aside as a separate dessert. Oh, and for sustainability, zero/waste purposes, I don’t use parchment paper, turned out perfectly fine without. 1 week, or 1 month in the freezer. My daughter and I make these every 2 weeks. She does most of the assembly work and I do the cleaning, so it’s a win win for us! We either eat these on the way to workout in the morning or as soon as we’re done. We don’t stray from the recipe too much as we love it but have been known to throw in some coconut and puffed quinoa. Thank you so much for an amazing recipe!!!! I love these! I substituted the oats with popped amaranth because I had some to use up. It worked really well. I like the fact no oil is needed. They’re very rich too so I am less likely to overindulge :-) and it’s great that they can be stored in the freezer. Thanks for the recipe. Hi! Any other moist dried fruit should work, raisins and dried cherries being the best options. Hope that helps! I don’t eat dateses, what could I add in instead? These are so tasty ! And so decadent. Very happy with this recipe ! I might just buy a big bag of mixed nuts next time, nuts aren’t cheap to buy individually so hopefully a bulk bag will be ! What would be the best way to decrease calories and increase protein? Read that someone added some protein powder and decreased the cocoa powder, but really how many calories are in cocoa powder? (Rhetorical question:) It seems the dates have the most calories. . . any suggestions? Hi! Adding a scoop of protein powder will up the protein in your brownies for sure! The almonds and dates are the two higher calorie ingredients in this recipe, but the almonds are high in protein (and lots of other good stuff!) and the dates bind the granola bars together. If you do try adding some high protein ingredients, consider nut butters as well? Happy baking! DANA MY HERO! These, like every other recipe I’ve made from your blog (and I mean EVERY one I’ve made), are AMAZINGLY delicious and awesome and a number of other positive adjectives that I will spare you from having to read. I made these with ingredients that I had on hand, so i ended up subbing half almonds and half hazelnuts instead of walnuts for the meal. And TOASTING the nuts and oats beforehand: I’ve died and gone to granola bar heaven! These are perfect for just grabbing and bolting out the door when I’ve slept in 10 minutes too long and don’t have time to make a smoothie or eat a bowl of cereal, and they are approximately 8,496 times more delicious than any store-bought granola bar could hope to be. 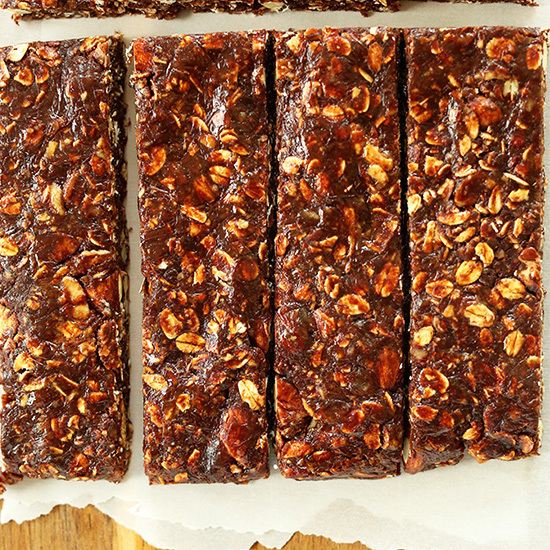 Crumbly yet gooey, chocolate-y and oat-y, on-the-go granola bar perfection. 10/10. These are the best thing I’ve ever made! As a university student I find it difficult to find cheap, healthy vegan snacks- but with the ingredients totalling up to £10 and being bulk bags, they’ll last me forever! Thanks MinimalistBaker, I’ve posted a photo of them on my Instagram and they look delicious! The only difference I made was adding dedicated coconut instead of walnuts- cheaper and a nice twist on things- and subbing nuts with needs. Amazing! I saw the word healthy and thought worth looking at this to replace the high sugar granola bars at 13.6g of sugar. These are 25g of sugar – no wonder they taste good, moment on the lips…..
Just made these last night, they were epic. Only thing I did differently was used all pecans, instead of mixed nuts, as thats what I had, as well as the walnuts…I also microwaved the peanut butter and maple syrup, took 10 seconds to get to a good consistency. Got 12 bars from this. It was hard not scoffing 2!!! They are very very tasty. These look so delicious!… except I don’t eat nuts. :( Any suggestions for substitutions? Hi Alyssa, I would substitute the nuts for seeds and extra oats! Maybe try a mix of sunflower, pumpkin, and flax? Let us know how they turn out! Oh I couldn’t believe how it turned out!!! So good. Rich chocolate flavores with goodness. I made these without nut butter and add more maple syrup. Thanks for sharing the recipe! ? Can I use more maple syrup or Sth else instead of almond butter? I don’t have nut butter.can you suggest me Sth else plz? These are amazing! I am bringing them to an event tomorrow and I am sure they will be gone ASAP. For those of you that were brought here looking for a healthy snack (as I was) I was still a little concerned in the beginning. I made sure that all the nuts I bought were raw, but next time I would make it without the pecans and add healthier nut (pecans are probably the reason these have such a high calorie count). Similarly, I chose to use a raw almond butter to get rid of salt. I would be careful when you’re buying the almond butter. The healthy brand I bought (Barney Butter – Sprouts) was 190 calories per 2 tbs. For this recipe you need 4 tbs which is a lot of calories. When you break it down to individual bars the calories from the Almond butter I used is about 30 per. The rolled oats come out to 30 per. Dates =34 per. Almonds = 6 per (if you measure them whole as I did). Walnuts 10 per. Cacao power: 4 per. Honey= 24 per. So in the end (without pecans and with good peanut butter) its only around 128 calories and very low sodium. This is almost three times less then a cliff bar. This is assuming also that you get 12 bars out of the recipe. I finished with 16 so it may be a little less per bar depending. A subway 6″ chicken teryaki. They are indeed lovely don’t get me wrong – but if you snack on these as part of a calorie controlled diet you would have to leave out a meal at this amount. These were absolutely delicious! Thank you so much for clear instructions… I get nervous when making things, but your descriptions and pictures really helped me out! I just made these and they are amazing!! I love the toasted taste they have. Total chocolatey goodness! Hi Dana! 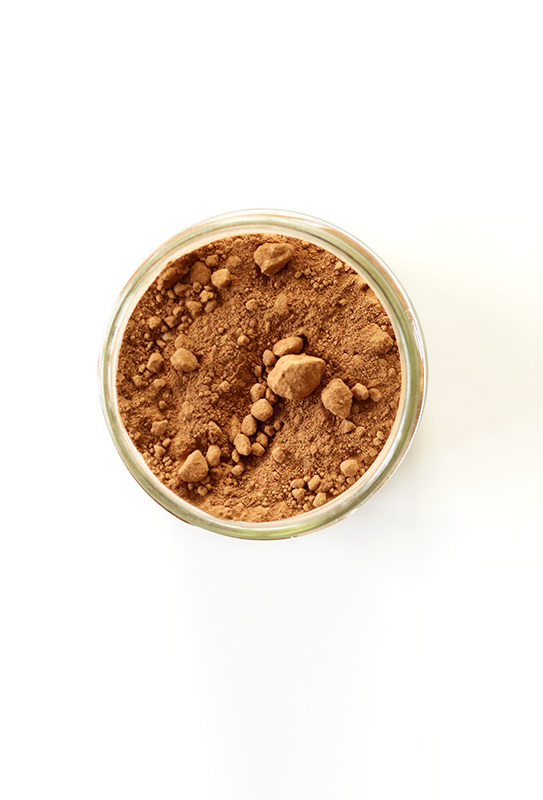 Can I use carob powder? I would love a nut free granola bar as my kids school is totally nut free and only really bad granola bars with a ton of sugar and other crap seem to be fully nut free and my kids love granola bars! Do you have a nut free version or any ideas for what I can substitute the nuts for? Thanks so much! I loved the texture of these and, of course, the chocolate, but I felt like they could use a bit of salt. I’ve made these twice now and am so impressed! I added a bit of chopped up dark chocolate as well and serve them up for a healthy pudding! Thank you! These bad boys are dangerously good. I’m in love! BEAUTIFUL!!! I’m cutting down on sugar and have fallen in love with these. I added some macadamia and roasted hazelnuts which give them a gorgeous nutella-y flavour ans added just 1/8 cup of fruit syrup. Sooooo delicious. Love all your recipes. Thank you. I have made these many times for group potlucks and everyone loves them! I have been told by a number of people that they taste like an Eatmore chocolate bar….and I would agree! Just made a batch of these and OMG amazing! Thank you for a great recipe that’s healthy and the kids love it! Do you think it will mess up the texture/consistency if I made these without the agave/maple or reduced it by half? I really like this recipe and want to make it for breakfast, but my doc’s having me lower my carbs in the morning. I’m sure it would, but let me know how it goes if you try it! You can use this recipe as a guide. I just made these and they are FANTASTIC!! Totally satisfies the chocolate/sweet fix and yes only need a small square..rich and filling! Hello! I was wondering what you would recommend as a substitute but instead of walnuts ? I really want to try these but am allergic to any nuts shaped like little brains lol.. So pecans as well. I’m not deathly allergic but I do get quite itchy! I want to give these a try just not sure what other nut you would recommend that would still get me the ground up walnut consistency! Originally I was thinking maybe almonds and peanuts until I saw that you grind up the walnuts ! And I don’t think ground peanuts would be quite the same lol… Any suggestions there ? Thanks ! These look amazing ! I want to make these but I don’t have cocoa powder. Can I use melted chocolate chips? How would you recommend going about that? Wonderful! Thanks for sharing, Carmen!! Would I be able to use dried dates instead? It depends on how dry they are…You may want to soak them in warm water for 10 minutes to soften them up, otherwise, they can be too firm to blend. I made these this weekend…we may never make another bar, other than these. They’re so good…my boys gobble them up, not knowing they’re good for them. Thank you for this!! I am so making these!!!!!!!!!! Yes!!!!!!!! Delicious……made some today……perfect for after HITT class…..do I need to keep in the freezer or will the fridge do? I made these today and they came out amazing. I toasted the pecans and oats, which I highly recommend because you can really taste it, toasted pecans remind me of pecan pie. I used maple syrup to keep the recipe vegan and dark cacao powder. I forgot to roughly chop the pecans and almonds but they still were great. I calculated calories for myself and came to about 230 per bar when cut into 14 equal pieces. Great recipe, my first time making granola anything and I’m excited to try out more recipes! Wonderful! thanks for sharing, chelli! It says they have 352 calories! Is that correct? Sounds like a lot! I use them as a meal replacement, or for a snack for my very active kiddos. It’s more than a Starbucks muffin. I made these granola bars recently and substituted pistachios for the other nuts. They were so delicious! I shared them on my blog today. Thanks for another great recipe! LOVE the way these granola bars tasted- however mine turned into more of a crumble than a bar formation. Is there any reason why this happened and why it didn’t stick together as well? Perhaps you didn’t mix your dates enough? Or the dates were too dry? myndaughter is TN allergic. Would these still work leaving out all nuts? Just made these for a camping trip… soooo good! They really do taste like brownies! Im really loving this recipe, but i would like to omit dates or dried fruits altogether. Would increasing the honey-butter fraction make up for it to the the binder? Maybe but I haven’t tried! Let me know if you do. I already have almond meal. Would i still need a cup or less? I’d start with 3/4 cup and add more if it’s too wet! I made these last weekend. They are just divine. I have guests staying in the appartment this week and they really enjoy them each morning. I love the idea, the simplicity of the taste and the little surprise every time I bite into a toasted pecan or almond! Love it! Hi, my daughter gave me a Bobos Oat Bar and it was very good. This caused me to search for a healthy bar to make. All of your comments are very good and I will try these. I really need something healthy and being Diabetic, do not want anything too sweet. Thanks for sharing. Hope mine come out as good as yours. I want totry this recipe but I don’t like walnuts, canI replace or omit them? i made these one day when I was craving brownies. These are the best!!! My entire family loved these! My husband liked them so much he took a bunch to share at work. I made a double batch and it disappeared within a couple of days. Just enough sweetness to cure that sweet craving, and the rest of the raw, healthy food is a must in my diet. Making another double batch today. Thank you for sharing! Thank you for these. I didn’t make them though into bars, but put them in a mini muffin pan for granola bites. Eating 1-2 is perfect for my sweet craving. My daughter loves them too. Thank you so much for this recipe! I can’t stop making them! Amazingly delicious snack and pre-post workout sustenance. A sweet treat for life! I didn’t follow the recipe exactly– having a baby is distracting work lol, and by the time I realized my mistake, all I could do was press on and hope it was still good. I just put everything in my food processor and blended it into a semi-smooth dough(y substance). So even though it doesn’t look like the above pictures, it’s still DELICIOUS!! This is definitely something I’m going to make again and again. Made a mixed up version of these and the Super Seedy bars (with 1/2 cup protein powder subbed out for 1/2 cup of oats). For those with nut allergies, you can definitely replace the nuts with equal parts seeds (sunflower, pumpkin, chia, hemp – any combination) with really good results! Best ever snack, workout fuel, and dessert. The best part? All the girly-hip-lovin’ fats we need. I made these last week and they are all long gone. I used honey and didn’t bother toasting anything, just used them as is. It was super quick and easy. I stored them in the freezer and we all just ate them that way without defrosting. Surprisingly very filling for a quick breakfast on the run as well. Thank you!! I am allergic to walnuts! Maybe dried figs? Or dried plums? I think you need some sort of chewy and sticky fruit to give it that binding property. You totally can’t taste the dates in these bars. They really just add sweetness and the necessary stickiness. My husband and sons don’t like dates either, but they eat these bars like someone was gonna steal them! I made these as both bars and as bite-size balls. Delicious! I make my own vegan granola but have never taken the time to make my own granola bars (why? I have no clue! it’s all the same amount of work!). I came across this recipe on Buzzfeed and it is GOLD! Thank you SO much for sharing it! Now, I make my own **vegan** granola bars all the time, thanks to this recipe! FYI, I use coconut milk and almond butter as the binder, and add a little bit of hand-ground chai-tea mix to give these bars a Christmas-y taste :) YUMMY! Thanks again for creating these! About how many calories per bar? You can see that in the nutrition box. Yum! Very tasty. Great idea for a healthy gluten free snack. These sound delicious! Unfortunately I’m a broke college student with no access to a food processor or blender. Do you have any suggestions for how I could adapt this for a simpler kitchen? If you’re willing, you can just use a sharp knife and a cutting board to finely mince, chop everything together! I didn’t use a food blender or processor! So chopping everything up works perfectly!!!! I can’t wait to make these bars but as I’m French, my English is quite bad haha so I guess I’ll have to translate the whole recipe ! Anyway, these bars seems sooo tasty and really nutritious. Thank you once again ! This was perfect! I substituted the pecans with cashews because I don’t like pecans and I used dark chocolate cocoa powder. I’m having a tough time trying not to eat them all in one sitting! They taste amazing! My podcast “Common Room” is going to feature your bars on our next episode. We are doing a feature on ‘space food’ so I needed something that was nutrient rich (high protein, fat) yet tastes good and could stay together in low/zero gravity. These sounded perfect! And they are! Thanks! You guys are featured here and they episode F3 Ep 18 should be up by the end of the week. I may have gushed ALOT! Thanks again! Best find! Hello! I made your chocolate chip almond butter granola bars last night and they are so good! My question about this recipe is whether you used sweetened or unsweetened cocoa powder. Thanks in advance! So good! I tried chocolate chips and chopped apricots, and it worked out great! I made these and they turned out great although mine was a slightly different version. I forgot to buy walnuts so I didn’t have them in my recipe. I used the oats to make the “meal” since I didn’t want the whole oats in there anyway. These look amazing!! Would sunflower butter work instead of almond or peanut? Dates are quite expensive in my country. Any other moist dried fruit should work, raisins and dried cherries being the best options. Hope that helps! I didn’t have quite enough dates left on hand (after making the 5-ingredient bars last time hah) and also didn’t have quite enough nuts on hand. I used only about 1 cup of oatmeal to try to match the amount of dates and nuts, and also less cocoa powder. I did add dried apples and dried cranberries in, though. I also added in 1 scoop of protein powder for a little extra punch. Then I used the regular amount of peanut butter and honey. I was trying to keep it from being too dry and crumbly which was my problem on the 5-ingredient bars. I think it came out just perfectly. I put it in a 9×9 dish and into the freezer for 20 minutes, and they all cut perfectly. I got maybe 10 or 12 bars out of it. Much better than the store where you only get 5 per box! Do you think you could swap the dates for prunes? oh.my.goodness! Thank you so very much! I made these heavenly bars yesterday, and actually have to talk myself out of the entire kitchen! The pull is strong!! I want one…or all that remain…now! haha, that was my issue, too! had to share them with friends right away!! Awesome! Bars are in the freezer… ate some of the mixture before pressing it into bars and was very impressed. What a perfect consistency. I’m a pretty avid bar maker (eat them before the gym), and am super excited about these. thanks for sharing! I don’t cook with buckwheat much but will look into it more, especially the sprouting thing. Interesting info! These bars are DECADENT! I have made them a few times, and most recently substituted 1/4 cup of the cocoa powder for chocolate protein powder. They were just as delicious! They always get rave reviews, and I love making them for/with my clients. Thanks for a keeper! yay! So glad everyone likes them!! Wow! Absolutely delicious. I’m sure they would have been even better if I didn’t rush through reading the recipe (I was trying to get the noisy stuff done before nap time). In my haste, I toasted all of the nuts and oats together, and then still rushing I poured the entire baking sheet into the processor and processed the oats, the walnuts, the pecans and the almonds. As I was pressing them into the pan, I finally noticed “hey that doesn’t look like a granola bar- it almost looks like a Larabar” I quickly reread the recipe, and of course I immediately saw my mistakes. Well, mistakes aside this is delicious! I’ll definitely be trying your recipe again, the CORRECT way, once this batch has been devoured, which should be in a couple of days. Thanks again! I made these a couple of days ago, and I have almost single-handedly finished the whole batch! ;) This recipe is absolutely delicious, very customizable (I didn’t have pecans or almond butter, so I used chopped almonds and peanut butter, and it turned out great! ), and so nutritious because of the raw cacao powder. However, I am aware that medjool dates are particularly high in calories and (natural) sugar. I wonder if mashed bananas could be used in replacement of the dates? I just found and prepared this recipe for the first time, and it is delicious! I am wondering if the banana would completely change the consistency since the dates are the primary ingredient? Have you had a chance to try it with banana yet? Yumm, these look great and I’ll have to try making them! I bet you could grind up some raw oats and coat the outside of the bars in them so they don’t get as sticky! You had me at BROWNIE. Btw, do you get your dates wholesale? I get mine at Aldi’s for super cheap (deglet nour), and for medjool Trader Joe’s has great quality ones in the refrigerator section. Most health food stores carry them, too. It’s also great to get dates at an Arabic grocer. Typically, dates from the gulf are vacuum packed and soaking in their own juices! The come out gooey, completely caramelized and incredibly sweet. They are perfect for recipes because they don’t require soaking and you can use half the amount :-) making these bars now and the “batter” tastes ridiculous! I saw this recipe, got excited/started drooling, already had all needed ingredients, so went ahead and made these last night! I cut them this morning and ohhhh my goodness. Total yumfest. I’m glad I took your recommendation of toasting the oats & pecans – the flavor it adds is awesome! I used an 8×8 pan and ended up cutting my bars thin and got a ton out of this recipe. My almond butter was raw unsalted so I threw in some sea salt (& sprinkled some on top before I froze). Great recipe! Y’all def need to make. This will be seen again in my kitchen for sure. Perfect amount of crunch, chocolate and toasted oatiness. Glad this “mistake” happened! These look so good! And a few preceeding recipes I have not had a chance to say “Yum” to! These are like larabars on steroids!! YUM! I’ve made something like this before, but I have to say, yours look so much better! I love the texture you have going with the larger nut chunks. And pecans and oats, too? Yum! Thanks so much for sharing. I am in Oregon and have bought dates at Fred Meyers and Haggens Grocery stores no problem. Freddies even has them in the bulk section! Sher, good question! To be honest, I’m probably not qualified to answer a question about digestion. If you’re worried about consuming them raw, definitely toast them up for easier absorption. I prefer their flavor/texture this way anyway. Hope that helps! PS I just LOVE your photos…all of them! how long do these bars last…should I keep in frig….or store on counter? Hi Janet! Store in an airtight container in the freezer or fridge to keep them extra fresh. In the fridge, 1 week, or 1 month in the freezer. I eat raw oats every morning in my yogurt. I’ve never had a problem. Where do you buy your dates? I found that in Washington state it’s not that easy to buy them, or maybe it’s just my amazing searching skills… I know they sell them at winco idk if you know winco but it’s kinda low quality store, not sure if I should buy them there.. Or it doesn’t matter? I just got some at Costco that are really good. If you’re in the Seattle area try Pike Place Market, or PCC. 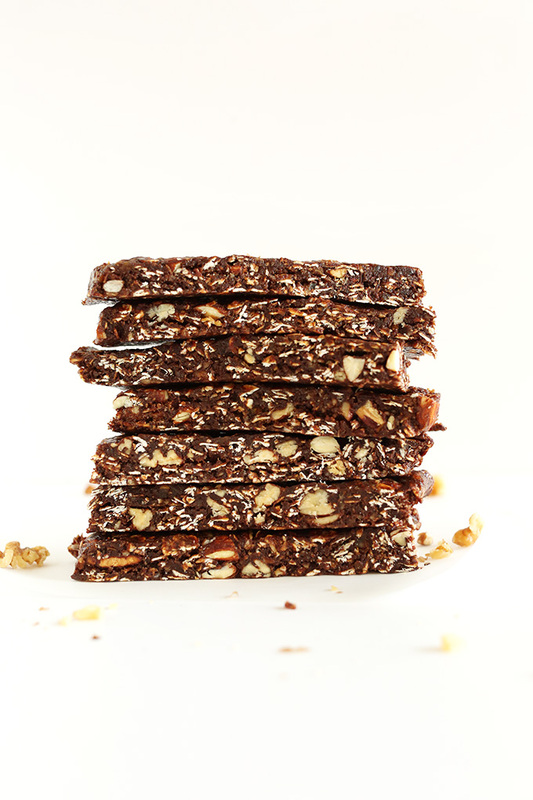 Raw brownies – Im in!! Raw brownies are so amazing, aren’t they? I think everyone in my family can agree that the best brownies I’ve made are raw + vegan. (which is awesome!) These brownie bars look incredible. Like, seriously. Perfect. Oh goodness me, these look totally ace. I can see them becoming my new go-to snack. Love it. Love your styling on these. These look GREAT!! 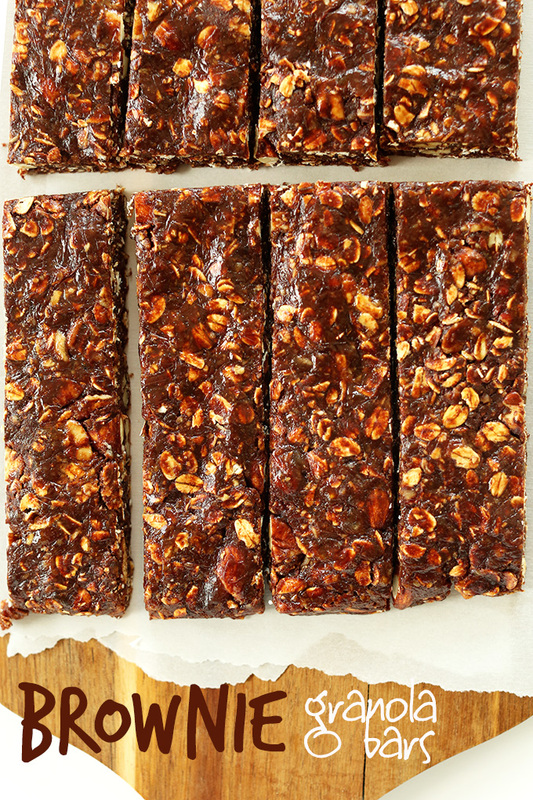 Can these no-bake brownie granola bars be baked so as to be more like granola bars? I don’t think I would care for the taste of raw brownies. Hi I forgot to soak dates in warm water what can I do ? Oh these look soooo good! I can’t wait to try them! This looks so yummy! I love a good homemade granola bar.